Congratulations, you've made it through the weeks of training for your big race. Here are a few tips on what to expect race day and how to have your best race possible. Eat breakfast. Many athletes are too nervous to eat breakfast but it's necessary to help you race your best. Eat something you know agrees with your stomach. If you can't keep food down, drink a smoothie or sports drink. Allow plenty of time to get to the race. Leave early to account for traffic, getting lost, bathroom stops, and anything else that might slow you down. Aim to arrive 90 minutes prior to the race start. Once at the race pick up your race numbers and timing chip, get body marked, and set up your transition area. Use a brightly colored towel or mat to help identify your spot. Put your race numbers on your helmet, bike and race number belt. Put your bike in an easy gear and load your bike with food and water. Arrange your cycling and running shoes, helmet, sunglasses, hat or visor as desired. Be sure to walk the transition area and note which rack your bike is on. This will help you get your bearings so that you're not running around in transition trying to locate your bike. Jump in the water and do a quick warm-up to get used to water temperature and your wetsuit. Try to take note of any currents or chop and take a few moments to practice sighting. If you are unsure where to position yourself, start toward the back and/or side of your swim wave to allow the faster swimmers to get ahead of you. Try to stay calm. The first 5 to 10 minutes of the swim start is very chaotic. If you start to panic, try the backstroke or sidestroke until you feel less anxious. Do not rely on the person in front of you for sighting (as they may not be going the correct way). 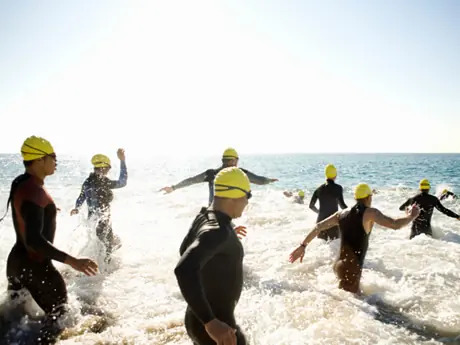 As you finish the swim, unzip your wetsuit as you exit water and take off your cap and goggles as you make your way to the transition area. Nicole Weidensaul is the owner of Fit 4 You, LLC which offers individualized coaching for runners and triathletes of all levels. She is passionate about guiding and inspiring her athletes to be their best. You can reach Coach Nicole at Nicole@fit4youprograms.com.